This PDF 1.6 document has been generated by Word / Mac OS X 10.4.11 Quartz PDFContext, and has been sent on pdf-archive.com on 27/02/2014 at 02:35, from IP address 188.217.x.x. The current document download page has been viewed 761 times. File size: 610 KB (4 pages). © Pierrot Yarns (Gosyo Co., Ltd.). Translation by Linda Lanz. No gauge is specified. Use hook size needed to achieve a tight fabric so stuffing will not be visible. Note: instructions use US/Japanese conventions. useful to mark the beginning of the “round” with a stitch marker to keep your place. leaving 10cm (4&quot;) tail. Set aside until finishing. tail. Set aside until finishing. 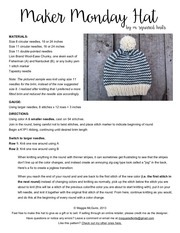 recommended, but any stitch that joins the pieces snugly and is not unsightly will suffice. until the end is pulled inside and effectively hidden. Stuff arms and beak and attach to body, using diagram below as a guide to placement. up—as a guide to their placement. as shown in first diagram above. This file has been shared by a user of PDF Archive. Document ID: 00148820.